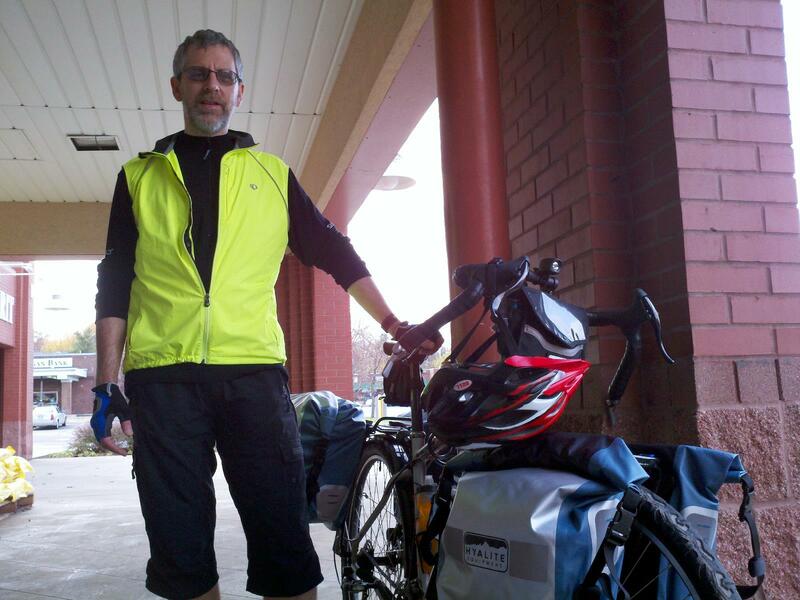 Panniers and bivvies and Crocs, oh my! I’ve been helping my friend Keven select bike-camping gear lately, and so we planned a Sub 24-Hour Overnight to test it out. Keven rode down to meet me in Peninsula, and we left as soon as I got off work at 4:00pm. We headed up to Hudson and stopped at the Acme for supplies. I brought my commuter bike this time around, because it was the bike most ready to go in touring mode (my Salsa Fargo currently has mountain bike tires on it). 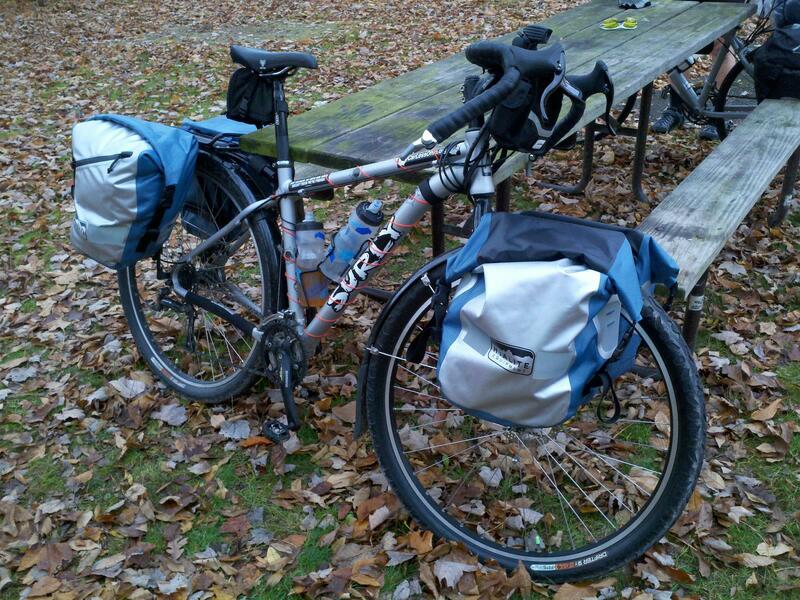 Keven rode his Cannondale flat-bar commuter bike, with his gear all on the rear rack. I had a couple new pieces of gear of my own to test out. First were my new panniers from Hyalite Equipment (formerly known as Pacific Outdoor Equipment). The rear panniers are sold as a set, and the front panniers are sold individually. The rear panniers are left- and right-specific, with cutouts for heel clearance. The front panniers are ambidextrous. The rear model has zippered side pockets. They all are waterproof, and use a roll-top closure, with side-lock buckles and straps to hold the roll-top in place. There’s a loop of velcro attached to the ends of each strap, so you can roll up the excess strap and hold it in place without it blowing in the wind and getting caught in your spokes. The R&K hardware is adjustable, so you can make it fit almost any rack. It all looks kind of complicated at first, but once you get the hang of it, it’s easy to make all the necessary adjustments the first time you pack up for a trip, and everything just attaches, detaches, opens, and closes easily during your trip. There’s a double pocket on the inside of each pannier, which would probably be big enough for a pair of flip-flops, but not big enough for a standard pair of shoes (or Crocs). My previous panniers were Axiom Monsoon (front) and Typhoon (rear) panniers. They also had roll-top closures, but with an added flap that dropped down over the roll-top. I found that the flap just got in the way more than anything else when I was trying to get stuff into and out of the panniers, so I don’t miss the flap on the Hyalite panniers. The one thing the Axiom panniers had that the Hyalite ones don’t is a stiff bottom that allowed the bags to stand up on their own when not on the bike. This was handy when packing the bags at home. I find, however, that during a trip, I usually leave the panniers on the bike most of the time, anyway, so I don’t think I’ll miss this feature, either. 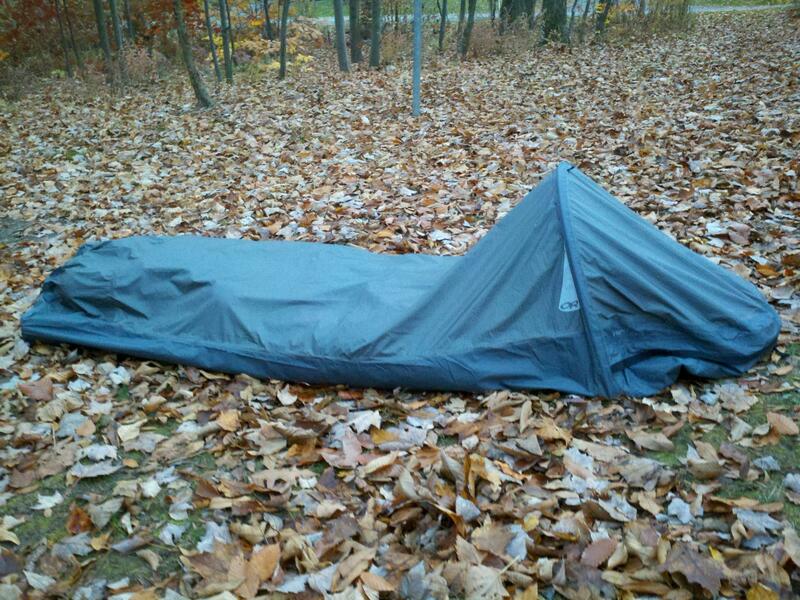 In my left rear pannier, I had my sleeping bag, pad, and shelter, with room to spare. In my right rear pannier, I put a pair of Crocs, a pair of pants, t-shirt, sweatshirt, underwear, and a spare pair of socks, hat, pack towel, a bottle of camp soap and sponge, and my toiletries kit; again, all with room to spare. In my right front pannier, I put my stove, cooking pot, coffee press, bowl, mug, utensils, small pack towel, small scrubbing pad, and fire starter sticks and matches. After putting my food supply in here after the stop at Acme, I still had room to spare. Finally, the left front pannier was left only for the obligatory 6-pack. While packing, at the last minute I decided to toss in the couple of zip-lock bags full of tools and spare parts. I didn’t think I’d need any of this for a one-night trip, but then figured that since I had the room, it would be foolish not to pack them in case I did end up needing them. This still left plenty of room for the 6-pack as well as room to spare. The next new piece of gear is not really bike-related, but it’s my new choice of off-the-bike footwear. No matter how comfortable my bike shoes are, I always find that it feels good to have a non-cleated pair of shoes to wear around camp in the evening. I’ve always felt flip-flops were not quite substantial enough. I never thought I’d buy a pair of Crocs; I always thought they were the ugliest and dumbest-looking things around. In talking it out with my other bike-touring friends, though, we came to the conclusion that they’d make the perfect bike-touring shoes. Enough support to walk around for reasonable distances, toe protection, they can double as shower shoes in less-than-ideal facilities, and you can strap them on a rack outside your bags if needed and not have to worry about them getting wet. 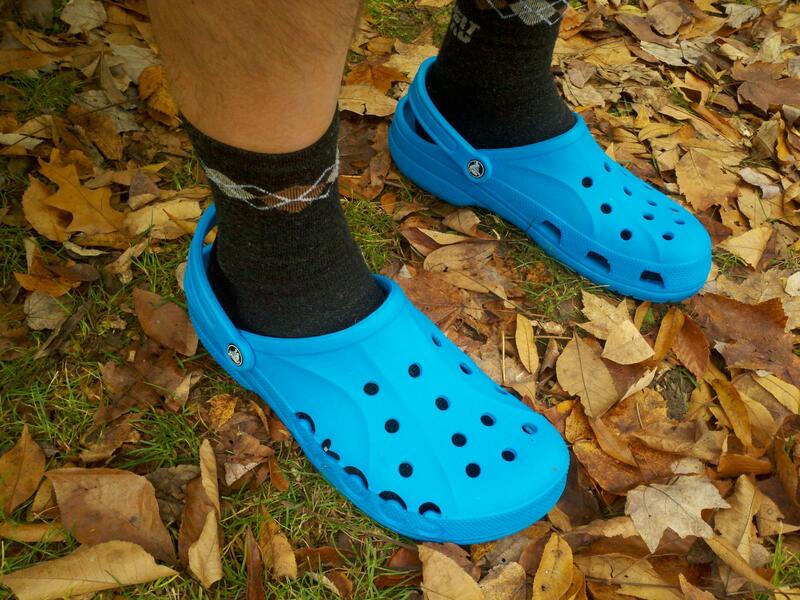 I decided that if I were going to dive into the world of Crocs-wearers, I may as well dive in feet first and do it right, so I got the garishly bright blue version, to match all of the blue components on my Salsa Fargo. The head area is supported by a single shock-corded pole. It’s got two stake loops on each end, plus a tie-out loop at the top of the hooped head area. I didn’t use any of these, but the stake loops would come in handy if it’s really windy and you need to worry about the thing blowing away when you’re not in it. The inside is plenty roomy enough for my rectangular inflatable sleeping pad. 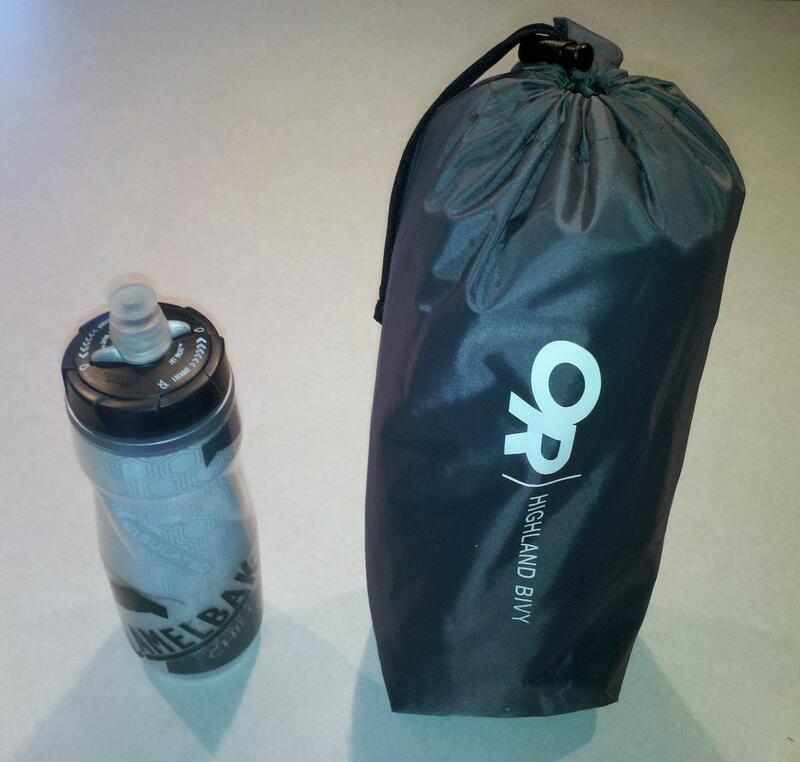 The head end has a mesh zip-up panel, and then the outer zip-around panel. Getting into the shelter is a bit more of a challenge than a regular tent, but it’s not that bad once you get used to it. It’s not big enough inside to change clothes, but the head area does provide enough space to read or write for a bit before you go to sleep. I had read in an online review that it’s recommended to leave the outer zip open six to eight inches in order to allow enough air to get inside for you to breathe. I did this after working my way inside for the first time. As I laid there trying to get to sleep, I was panting heavily and out of breath. I figured at first that this was just from exerting myself to get in, so I gave it a few minutes. After about 10 minutes, I was still panting heavily, and I realized that I was suffocating myself. I opened up the outer zipper completely, and that made all the difference in the world; I was able to breathe easy immediately. With the outer cover zipped almost all the way, the tension from the front and back is enough to keep the hoop upright. However, with the outer cover unzipped, the hoop drooped over. I’ll have to experiment some more; maybe unzipping the cover halfway would provide a balance of enough air with enough support for the hoop. Tying a guy-line to the loop on the top of the hoop would provide good support, but that might make getting into and out of the bivy that much more of a challenge. There were a few brief showers throughout the evening, but I stayed completely dry. With the outer cover unzipped, I had to try to make sure the edges of the top still hung out over the bottom edge, so that any water falling down would roll onto the ground rather than inside the bivy. This seemed to work well enough during the light rain this evening, but for a full-on downpour, this may not work as well. In conclusion, the Outdoor Research Highland Bivy provides a reliable and comfortable enough shelter for when I want an ultra-light and ultra-compact option for a one- or two-day trip. Whether or not I could stand having it be my only home for an extended six- or eight-week trip remains to be seen. Keven and I slept in and took our time packing up our gear in the morning. After making some camp coffee and having some breakfast snacks, we left around 10:30am and rode into Kent for a full breakfast at the Wild Goats Cafe. 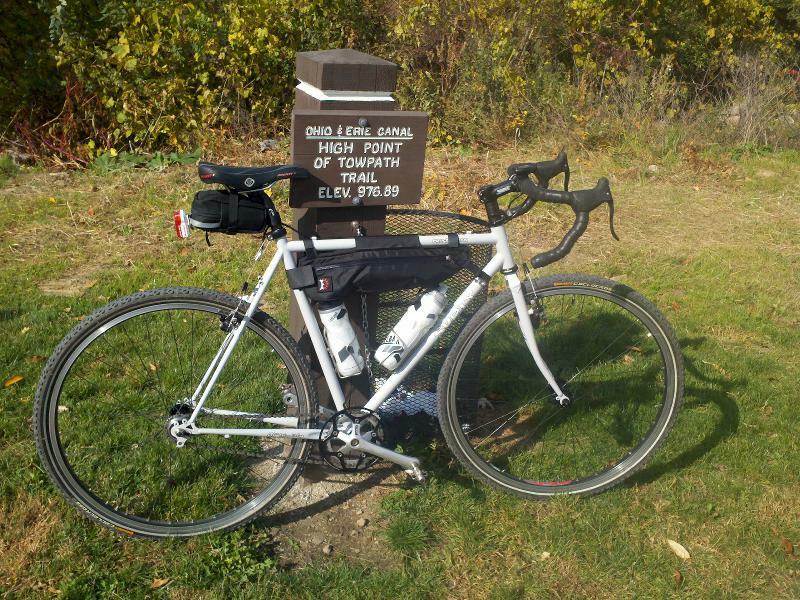 I rode a century on my singlespeed Surly Cross-Check about a year ago, all on the Ohio & Erie Canal Towpath Trail. I wanted to do it again this year. I thought about it the past couple of weeks on my mid-week days off, but errands and other life stuff got in the way. This weekend, I found myself with a Sunday off and no other plans. I got up early and headed out under darkness, driving down to the Botzum Trailhead, and got started pedaling just as the first signs of daylight made their way on the horizon. I stopped at the Valley Cafe to fuel up with some pancakes just two miles down the trail. I hopped right back on the bike after eating. I should have relaxed a bit and let my breakfast settle a little more. Perhaps too much “All Hailing the Ale” the night before didn’t help, as well. Either way, my stomach was doing somersaults the whole time. I stopped to take a break on the floating bridge on Summit Lake, then another longer break just before Snyder Road in Barberton, hoping things would settle down. This was the first time I’d ridden the new section of trail between Snyder Road and Eastern Road, which was the final part of the Towpath Trail to be completed in Summit County earlier this year. Anyway, my queasiness continued, and I started to debate whether or not I should pack it in earlier than planned. When my front tire went flat just south of Canal Fulton, that sealed the deal for me. I swapped in my spare tube, and was able to use my mini-pump to get it re-inflated enough to ride, although just barely so. 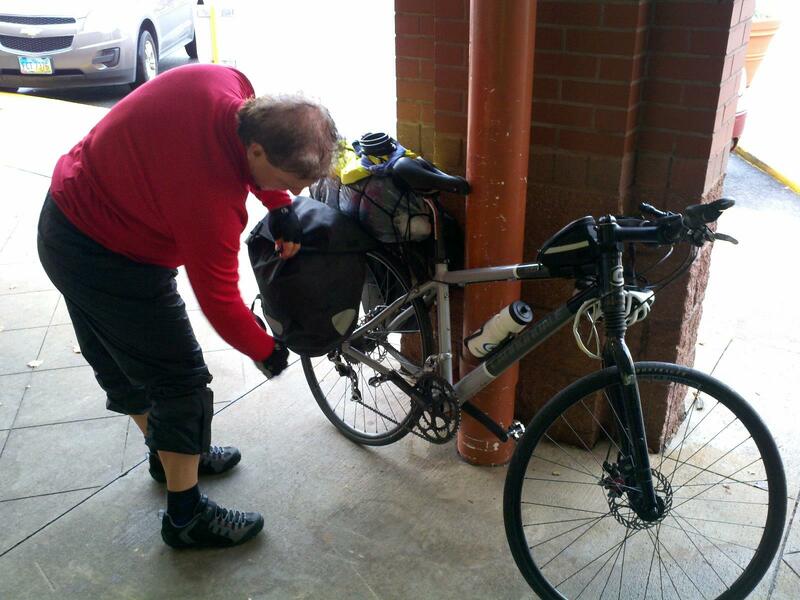 I continued south towards Massillon, hoping that Ernie’s Bicycle Shop would be open for me to borrow a floor pump. I started to see a handful of bright green Electra Townie bicycles coming towards me on the trail, which I assumed were Ernie’s rentals, so that was good news. I arrived at the shop a little before noon, and asked about borrowing a floor pump, which of course, they graciously agreed to. After topping off both of my tires, I hung out a bit, topped off my water bottle, and peeled off the base layer I was wearing under my jersey (it was starting to warm up quite a bit). I headed back up north and made good time. My gut felt a bit better, although still not 100%. I got back to my car around 2:30pm, with a total of 71 miles on the day, and no regrets. It was a fine ride and a great way to enjoy the unseasonably warm Indian Summer day.